Rates start at only $175/night!!! 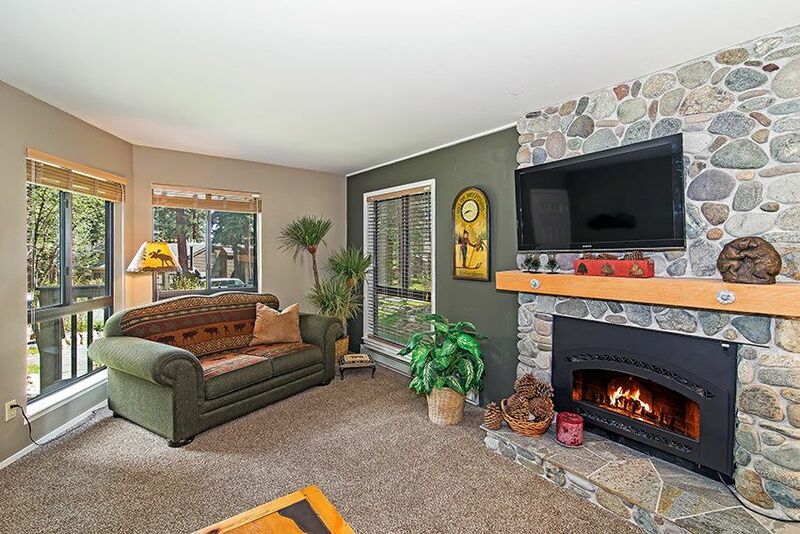 Newly remodeled and so comfortable and cute designed with Tahoe mountain decor! Just a short walk to Lake Tahoe and private Incline Beach. 2 FREE beach passes with each reservation 3 or more days - July & August only. Complex amenities Pool, Hot Tub & Sauna. Furnishings are Tahoe style with rustic log king size bed and a queen sofa sleeper in the living room. Extra 1/2 bath makes this 753 square feet very comfortable and accommodating for 4. Fully equipped kitchen. How about apre ski??? Those cozy winter nights are warmed by the romantic gas log fireplace. Or take a short walk to the association hot tub! Outdoor swimming pool (summer months only) are just a short walk from the unit. Great for the kids! Private, quiet setting in the pines. Lounge chairs provided by association. Beach towels available in unit. Indoor hot tub & sauna available all year round. Great after a day on the slopes. Diamond Peak shuttle bus picks up on the corner near the complex. Just a very short walk to bus stop. All basic supplies provided including hair dryer, soaps, paper towels, toilet paper. Just bring your food and tooth brush! Master bedroom has a large tile shower. Separate sink/vanity and stack washer/dryer. 1/2 bath with toilet and sink off living room for guests. Baseboard heaters. Wall thermostats in living room and bedroom. FREE open parking right at walkway to condo. Small fitness room with Treadmill and Elliptical & some free weights. Spacious. Very comfortable for your family. Right out front of the condo on grassy area. This condo is darling, super clean, in a beautiful location and the perfect place for our long weekend and out first visit to Lake Tahoe! Pam was very helpful and responsive to all my questions! We will definitely be back in the future! Penny was a delight. Always friendly and courteous with her questions. Love renters like her!!! She also tidied up my place before departing ... always nice to find the place so clean when a guest leaves. Cozy condo walkable to the beach. Responsive owner! I'm so glad you had a good time! Hope to see you back. Very Clean! Close to everything! I was warned in advance that the neighbors could be heard walking around upstairs, and so it did not bother me at all. The bed was super comfy and plenty of necessities on hand like dishes, blankets, towels, etc. Very cozy! The 2 TV’s were a bonus for watching World Cup Soccer, and I loved the classic movie collection provided. Nice people surrounding the condo made my stay extra enjoyable. Would definitely stay again. Thank you! The rental was great. It was perfect for the 2 of us visiting Tahoe for the month. Location was great ! Stayed for 4 nights and our 20 yr old daughter slept on pull out sofa. Loved the location, about a block from beach and close to Hyatt. King bed is very comfy. Beach towels, chairs, and beach umbrella provided along with passes for one day at one of the Incline beaches (with form to buy more if needed). Kitchen also had spices and bath had soap, shampoo, and conditioner. BBQ on site is charcoal only (no gas). Pool was refreshing and the day we used had it all to ourselves! Owner was great and allowed us to check in early. Hope to be back. Only downside was that you can hear the people upstairs as this lower unit. I'm so glad you enjoyed my condo, facility and location in general! You are welcome to come back anytime! Beautiful beach is about a 5 minute walk. Within a 5 mile radius you will also find 2 golf courses, casinos, restaurants and shopping. Incline Village is a quiet community with many nearby activities.